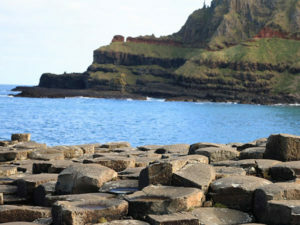 This exciting Causeway Coast Way walking tour starts in Cushendall and finishes Portstewart, taking walkers to areas of spectacular beauty along the Moyle Way, the Glens of Antrim and to the iconic Giants Causeway. This walking tour takes you on a journey through mysterious and mythical glens, lush forests and along one of the most alluring coastlines in Ireland. The scenic beauty and the diversity of landscape make the Antrim coast an ideal area to discover on foot. Fans of the TV series Game of Thrones will recognise some of the show’s filming locations. 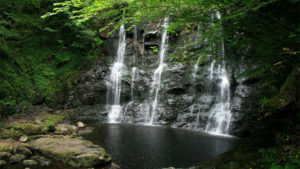 Glenariff Forest Park, over 1000 hectares of mature woodland with lakes, outdoor recreation spaces and areas of conservation. 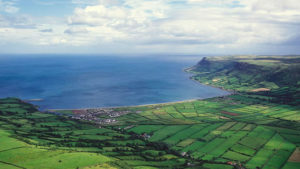 The Glens of Antrim and The Moyle Way consisting of nine stunning valleys running up the Eastern coast of Antrim. 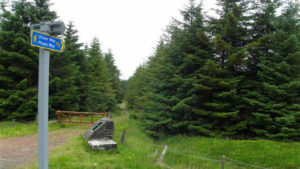 After breakfast, you will be transported to the entrance of Glenariff Forest Park to begin your walking tour in the park. Glengarriff is referred to as the Queen of the Glens for its size and beauty. There is a visitor centre and a range of trails to walk ranging from short 2km walks to longer 9km trails. The waterfalls walk on a shorter loop is highly recommended. The marked trail of the forest park will lead you through a variety of habitats and landscapes. The longest 9km trail takes you to a high point of the park and boasts picturesque views of the nearby glens. At the end of the day, you will walk the few kilometres back to your accommodation in Cushendall for the evening. Today, you will be transferred to the beginning of your walk at Orra Beg, on The Moyle Way. This section of the trail is a mix of quiet rural roads, forest trails and mountain tracks. From Orra Beg the route takes you along a forest trail to reach the mountain track contouring the side of Agangarrive Hill, following the banks of the Glenshesk River to join the Breen Forest Trail. This nature reserve harbours pockets of ancient deciduous woodland. The Moyle Way then takes walkers along a quiet rural road in the Glenshesk Valley. This area opens up panoramic views of the Coolaveely Forest and Glenshesk River on your right and Knocklayd Mountain on your left. The final section of the day takes you through Ballycastle Forest and finally into the town of Ballycastle where you will spend the next night. 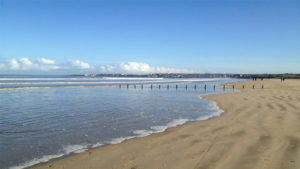 The town of Ballycastle is located on the most Northerly tip of Ulster and has a beach with views across to Rathlin Island and the Mull of Kintyre in Scotland. A visit to Rathlin Island is well worth a day-trip. The boat takes 20 minutes in each direction (not included) and there are a number of nice walks on the island. This would require a 2nd night in Ballycastle. After leaving the town of Ballycastle, the Causeway Coast Way takes walkers along a variety of rural roads and forest trails, always following the coastline as closely as possible. Some areas of interest that you will be passing are Kinbane Castle, built in 1547. This two-storey castle was the site or many a siege and battle through the 18th century. You will also see today the world-famous Carrick-a-Rede rope bridge: the bridge spans a 30-metre deep and 20-metre wide chasm and was originally erected by salmon fishermen. The island has been used for salmon fishing for more than 350 years. If you do wish to cross there is a charge of £4-6 depending on group size (not included). From the rope bridge it is only a short walk to you accommodation for the evening. The village of Ballintoy was used for the fictional town of Lordsport in the second season of TV series Game of Thrones, if you are a fan you might spot some familiar landscapes. As you leave Ballintoy walkers will be following the coastline along beaches, grassy cliff top trails and small rural roads. Highlights for the day include St Gobban’s church rumoured to be the smallest church in Ireland and the iconic Giants Causeway. A short detour to the ruins of Dunseverick Castle and following a cliff top path will take you around Benbane Head to the UNESCO World Heritage Site and Nature Reserve of the Giants Causeway. This world-famous landscape consisting of about 40,000 interlocking basalt columns is the result of an ancient volcanic eruption (entrance fee not included). Local legend would argue that it is was constructed by a giant from Ireland Fionn MacCool, when he was challenged to a fight by the Scottish giant Benandonner. Fionn accepted the challenge and built the causeway across the North Channel so that the two giants could meet (depending on whether you are from Ireland or Scotland this is where the two stories differ). In one version of the story, Fionn defeats Benandonner and in another, Fionn hides from Benandonner when he realises that his foe is much bigger than he is. Fionn’s wife, Oonagh, disguises Fionn as a baby and tucks him in a cradle. When Benandonner sees the size of the ‘baby’, he thinks that his father, Fionn, must be a giant among giants. He flees back to Scotland, destroying the causeway behind him so that Fionn could not follow. The Giants Causeway is the finish of the ‘Short Break’. Your last day of walking The Causeway Coast Way will be predominantly flat on a mixture of promenades, small roads, beaches, gravel and grassy paths. From The Giants Causeway your trail continues along Bushfoot Strand to the picturesque town of Portballintrae. Places of interest along your route today include Dunluce Castle. Positioned on the edge of a basalt outcrop, the castle is accessible via a bridge connecting it to the mainland. 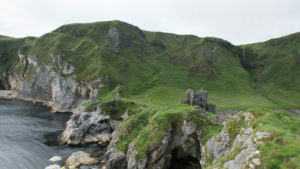 The castle is surrounded by extremely steep drops on either side, at some point a large section of the cliff broke away into the sea taking with it the castle kitchens. Once the centre piece of Dunluce town, the town was raised to the ground in the Irish uprising of 1641. Archaeologists believe they have only discovered 5% of this lost town. The castle fell into disrepair after the battles of 1641. In recent years, it was taken under the care of the Northern Ireland Environmental agency and is open all year round as a tourist attraction. Along this coastal walk today there is a selection of cafes and bistros to choose from when you take your break for lunch. From Dunluce you will continue along Curran Strand, Ramore Head, Ringagree Point, Blackrock and finally onto your accommodation for the evening in Portstewart. Belfast City Airport to Belfast City 9km: Airport Express 600 | Travel time 0H15 outside the main terminal leaving every 40 minutes | Fare £3.60 return. Belfast International Airport to Belfast City 20km: Airport Express 300 | Travel time 0H35 outside the main terminal, leaving every 20 to 30 minutes | Fare £10.50 return. Dublin Airport to Belfast City 158km: Goldline Express | Travel time 2H00 outside the main terminal, leaving every hour | Fare £20 approx one way. Step 1: Belfast City (Hight Street bus stop) to Cushendall | Translink Bus | Travel time 2H00, leaving every hour | Fare £17 one way. 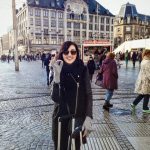 Step 1: Belfast City (Great Victoria Street Train Station) to Ballymena | Translink Rail | Travel time 0H50, leaving every hour | Fare £9 one way. Step 2: Ballymena (Ballymena Buscentre) to Cushendall | Translink Bus | Travel time 0h45, bus running every hour | Fare £15 one way. Portstewart to Belfast City: Portstewart (Promenade Portstewart bus stop) to Belfast City | Translink Bus | Travel time 2H15, leaving every hour | Fare £15 approx one way. 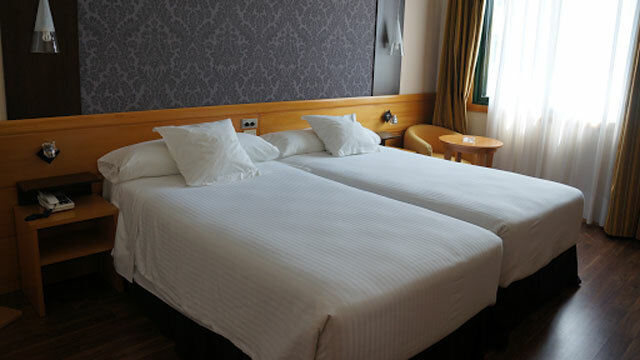 Airport Express 600 – Airport Transfer. Translink – Northern Ireland Transport Links.